Rice University was constructed in an area generally underlain by overbank deposits (fine clay-rich muds) of the Beaumont Clay formation. Locally, there are siltier soils and sediments deposited in small fluvial channels (e.g., the former Harris Gulch); the latter riparian areas are characterized by old tree stands whereas originally (ca. 1900) the rest of the campus area consisted of coastal prairie or marsh environments (William Rice's Marsh; also see 1921 aerial photo of the Rice University campus, showing the tree-lined course of Harris Gulch in the background). Much of the campus has been levelled by addition of fill dirt and planted with ornamental grasses, shrubs, and trees that are not strictly native to the property (see 1953 aerial view, following construction of the football stadium and parking lot). The near-subsurface geology consists of alternating flat lying clays, muds, and sands reflecting the gradual evolution of the area from an estuarine marine environment to a low energy fluvial environment (stream and related overbank flood deposits) characteristic of the Texas Gulf Coast. For example, excavations for Rice buildings often bottom in fine-grained estuaurine muds containing oyster and clam shells - such deposits today are found in places like Galveston Bay. Because the fine-grained, clay-rich muds are relatively impermeable, their presence at the surface (coupled with extensive pavement and building cover, leads to poor infiltration and rapid runoff of rainwater - hence, exacerbation of flooding. Such sediments at depth tend to trap formation waters in the more permeable silt-sand layers (old stream deposits) which then act as aquifers; there are several prominent independent aquifers at depths ranging between about 15 to >100 feet depth, each of which potentially may be tapped for water resources. Extensive water extraction from such shallow aquifers has over the past 100 years led to significant subsidence within the greater Houston area. Subsidence in Baytown has resulted in inundation of relatively recent housing developments. The Houston Geological Society is a source of further information as well as virtual field trips in the greater Houston area. The building stones used in Rice buildings present good examples of a variety of rock types not found in the greater Houston area. Periodic surveys of the greater Houston area (see attached) reveal significant ground subsidence over the last century, primarily due to removal of ground water and some hydrocarbon production. 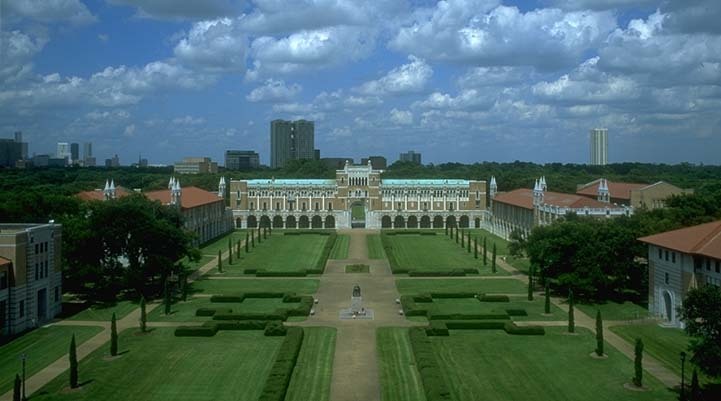 The Rice University campus has subsided by approximately 6 feet since 1911, when construction of Lovett Hall commenced. Progressive subsidence of the area has resulted in city ordinances to limit groundwater pumping rates. The Rice water well (TD = 1650' with pump @ ~450' below surface) is used to supplement municipal water supplies to campus; pumping currently is restricted to 20% of campus water consumpion (~50M gals/yr). Additionally, continuous or intermittent groundwater pumping occurs in some areas of the campus to minimize flooding risks (e.g., Sewell Hall, the football stadium). The combined effects of soil type, land subsidence, and construction type results in continued but variable damages of structures and pavement on campus. It is estimated that replacement of sidewalks alone costs about $20-30K per year, and intermittent repairs to buildings may cost 3-5 times as much per year on average (exact figures are unavailable). It should also be noted that soil properties are strongly influenced by moisture content. This leads to seasonal swelling and shrinking of clay-rich soils of Houston. Thus, soil moisture and water table depth are important parameters to consider in environmental assessments. Differential subsidence due to changes in thickness and type of fill dirt and soil layers, and/or in their physical properties, may account for some of the structural damage to campus facilities. Human interactions (e.g., choice of construction, shallow extraction of groundwater, etc. may exacerbate the natural subsidence hazards. Trees can also contribute to subsidence due significant extraction of soil moisture through the root systems. We will try to evaluate these issues through an environmental geology assessment of the Rice University campus. A class project (Geology 326, Environmental Geology) was designed to evaluate the nature and distribution of subsidence or settling problems on the Rice campus. 1. Compile available descriptions of engineering borings to get a three-dimensional perspective of shallow subsurface geology. These borings also provide information on depth of water table and some soil physical properties. Considering representative core descriptions from selected campus locations, prepare cross-section diagrams showing interpreted variations in subsurface geology for specific areas. 2. On the basis of the core information, recommend possible transects where seismic reflection profiles might provide useful detailed information. Seismic profiles ideally provide continuous records of subsurface geology below the survey line, whereas the borings provide discrete discontinuous information. Recommendations should be based on specific objectives revealed by or implied from the core data, cross-sections, or other information (e.g., structural damage to buildings). If necessary, prioritize these to aid in allocating available project resources (e.g., acquisition of further seismic profiles). 3. On Saturday, 7 Nov our class will meet (12:30, Lovett College commons) to review examples of structural damage in Rice buildings and pavement (cf. Appendix below), and to conduct a survey of other areas of the campus. Your survey responsibility is to document all types of structural damage observed, estimate whether or not this is recent or ongoing, and record your observations as keyed (e.g., by numbers on a facilities/campus map [clickable for more detail]) to specific buildings or areas. You may wish to bring a camera for photographic documentation, or use detailed sketches for this purpose. 4. Prepare a summary report describing your activities and conclusions. Include all documentation used in writing this report. The report and supplementary information will be due in class on Thursday, 19 Nov. The following list records some easily observed evidence for subsidence effects in the south Colleges area. This list also includes some reported examples from other parts of campus that have not yet been verified. South College quadrangle - this area formerly had a road connecting the inner loop and Main St. Evidence for the road bed is quite evident. Note damage to slab beneath benches in gazebo area; such damages were last repaired around 1985(?). pier failures below middle of building (near room #124) - note cracking extending to second floor or higher; distortions of window and door frames (very exaggerated in #124 bathroom); slab pulling away from walls; patio upheavals in acabowl; (apparently shallow fill contains a large amount of organic material in this area). Herring Hall - subsidence damage on west side (and inside) has been attributed to proximity to old sewers and drains that were not replaced. Campus streets, stadium lot - generally lack a concrete base, thus tend to move with the clay soil swelling & shrinking. Major repairs and repaving occurred on the inner loop road between the tennis courts and Cohen House in 1996. There are many other examples to add to this list. Many of the walls and sidewalks around campus exhibit cracking due to settlement and ground movement. Good examples can be seen at Lovett House. Because such damages are continuously being repaired, they may not be easily apparent. Also, it is difficult to fully ascertain the extent of subsidence/settlement damages to principal buildings because, apparently, there is no systematic archival record of this information. The approximate figures cited above for specific repairs were obtained through interviews with Rice staff members.